In the lead-up to the Middleton Country Fair in February each year, the Channel Highway north and south of the small village of Middleton comes alive with a parade of scarecrows. They’re sitting on fences, tied to signposts, alongside letterboxes and posted in front gardens. It’s well worth the slow, winding drive south from Hobart just to see the variety of scarecrows that the locals have devised. 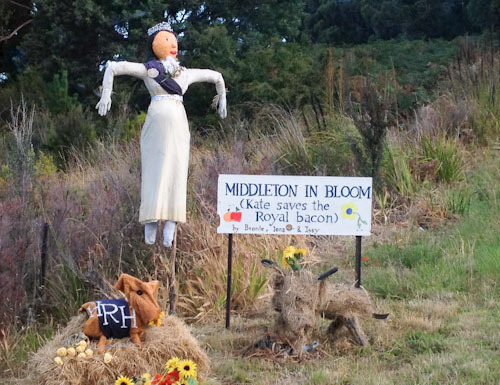 This scarecrow is quite a clever pun, combining the Royal Kate Middleton with allusions to the town of the same name. 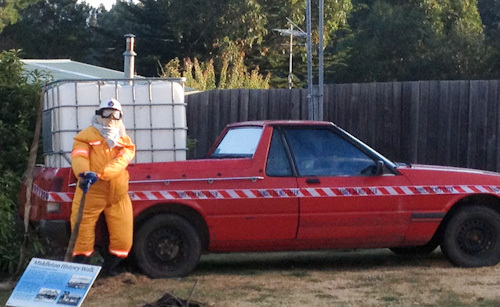 Even a fire-fighting scarecrow is quite handy this summer. 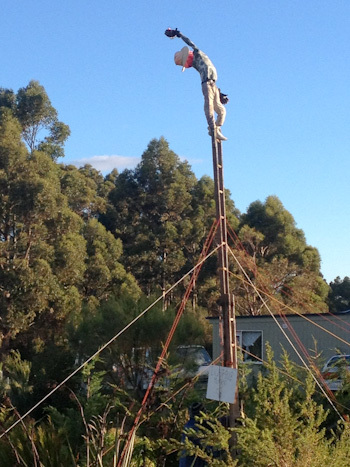 This pair of scarecrows (there's one holding the base of the ladder) are entitled "Bright Idea". This set of figures won the contemporary division at the fair. 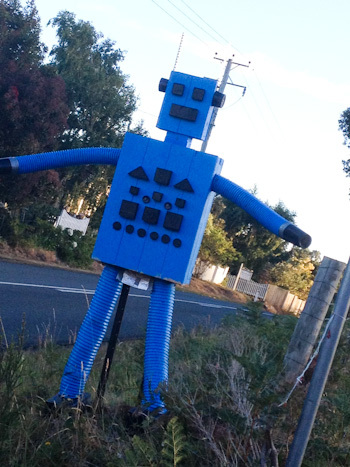 Our girls especially like this robot scarecrow. 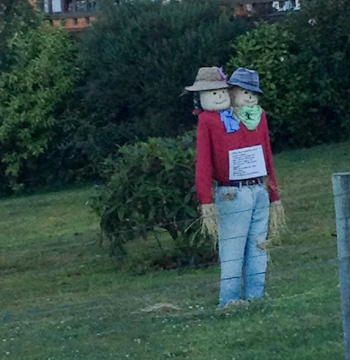 This two-headed scarecrow is a funny play on the clichéd slur that Tasmanians have two heads (from in-breeding). At yesterday’s fair, the scarecrows were judged within three categories: traditional, contemporary and the people’s choice. In looking over the thirty entries, it seems that humour is more important than craftsmanship. Our girls like looking over the scarecrow photos, pointing out the ones we've noticed during our travels. 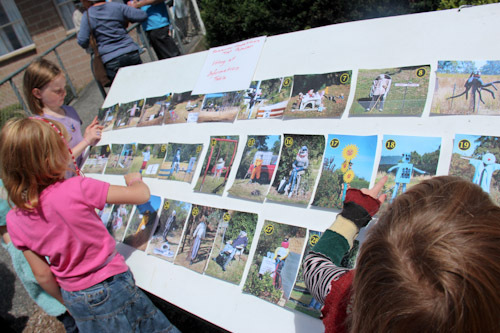 This sort of competition allows creative engagement from a wide range of community members. Some scarecrows were constructed by children, others were sponsored by businesses with a budget. It’s great to see a community enthusiastically engage in an activity like this, and it inspires me to one day enter our own family’s creation in a similar competition too! I love those scarecrows! I have a vague memory of seeing them the one time we were in Tassie. My daughter who is 7 has been obsessed with robots since she was four, she would LOVE that one.